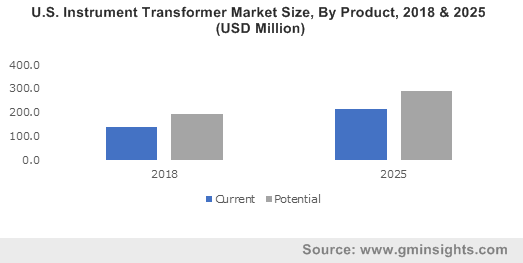 Instrument Transformer Market size in 2018 surpassed an annual installation of 1 million units and is expected to exceed USD 8 billion by 2025. Growing demand for electricity along with rising concerns pertaining to grid stability will boost the global market. Increasing fund flow toward rural electrification in line with renovation of existing grid network has further obligated the authorities to incorporate an efficient protection and monitoring mechanism. Therefore, rising grid complexities across the electric infrastructure in conjunction to the emerging peak electricity demand from end users will comprehensively augment the industry landscape. Adoption of smart monitoring units coupled with rapidly developing smart grid networks will stimulate the market share. Prominent industry participants have consistently been allocating funds toward the expansion of energy efficient and cost-effective units. Furthermore, escalating equipment precision to endure the frequent current and voltage volatility across sustainable electricity networks will stimulate the product adoption. In the recent years, current transformers have gained impetus owing to their characteristics to incorporate large primary current into a compact unit. Product versatility towards the protection & measurement of electricity networks along with rapid advancements to ensure operational viability will further complement the business outlook. In addition, advancing product configurations have laid comprehensive grounds for digitization to incorporate effective product integration will positively sway the market dynamics. In 2018, auto transformers accounted for over 40% of the overall market share. Operational flexibility and voltage regulations are key factors complementing the business scenario. Moreover, competitive cost structure, improved efficiency and system compactness will further stimulate the product adoption in comparison to the existing alternatives. Renovation & refurbishment of conventional T&D networks along with increasing space impediments have positively impacted the indoor instrument transformer industry growth. Amplifying real estate sector in line with ongoing industrialization across developing energy markets lay favourable grounds for product penetration. In addition, rapid expansion of transmission and distribution networks across emerging energy markets will further augment the business landscape. Oil immersed units are anticipated to expand over 7% by 2025. The technology owing to its enhanced efficiency in conjunction with longer life expectancy in comparison to its substitutes have attained significant market adoption. In addition, efficient cooling owing to declining hot spot temperatures coupled with comparatively advanced overload capability will further complement the global market outlook. Increasing competitive dominance coupled with enhancing end user awareness have positively influenced the solid insulated instrument transformer industry share. 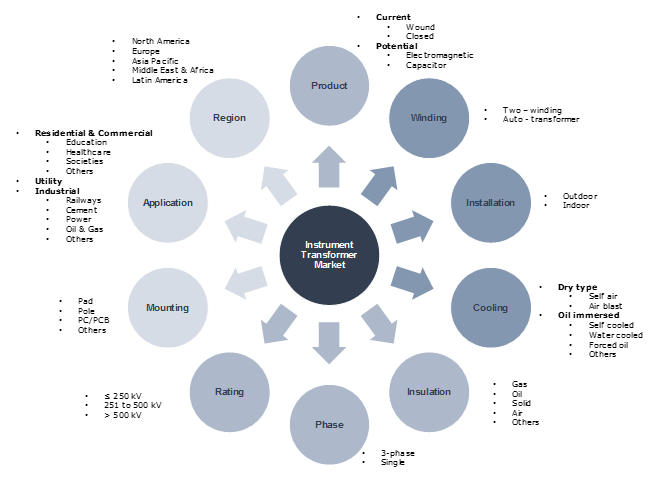 However, competitive cost structure, effective insulating property in line with compact product configurations are projected to amplify the product penetration. Paradigm shift from conventional technologies through consecutive integration of control units & digitized monitoring will further foster the industry landscape. 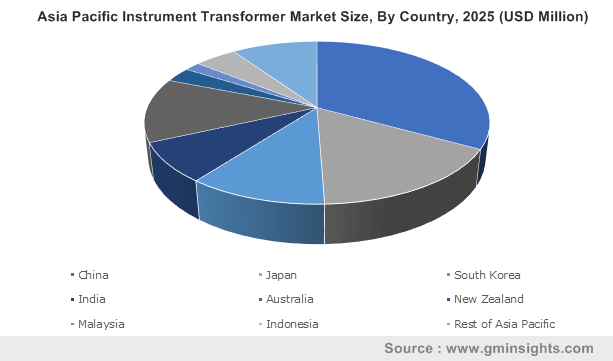 Enactment of favourable regulations to support the slumping small-scale industrial sector across emerging markets will augment the single-phase instrument transformer industry growth. In addition, expansion of a sustainable electricity infrastructure favoured by measures including leveraging schemes, incentives, and subsidies to avail a reliable electric infrastructure will further complement the business scenario. In 2018, ≤250 kV instrument transformer was valued over USD 900 million. Substantial growth across utility and infrastructure sectors in conjunction with rising electricity consumption will positively sway the industry landscape. Ongoing integration of smart grid networks in line with grid assimilation of renewable technologies will propel the product adoption. Furthermore, recurrent power lags and network interruptions across commercial & residential establishments will further stimulate the product demand. Escalation across the global transportation industry in association to the expansion of rail & road networks to develop a favourable supply chain mechanism will foster the pole mounted instrument transformer industry share. Developing electricity markets across Africa and Asia Pacific in the current years have laid significant focus towards utility-based transmission and distribution network expansion. Furthermore, growing infrastructural fund flow from private & public aided financial institutions across these nations will further propel the business scenario. Commercial & residential instrument transformer has witnessed a turnaround in the past decade owing to persistent rise in energy demand and rapid urbanization across the globe. Regulatory inclination towards the refurbishment of existing grid networks along with the upgradation of conventional product portfolios across developed countries will further boost the industry landscape. China market is set to observe an annual installation over 300,000 units by 2025. The industry is comprehensively driven by consequent demand for refurbishment of traditional grid infrastructure coupled with supportive regulatory concerns to strengthen grid sustainability. Ongoing adoption of control units and smart monitoring in line with growing infrastructural fund allocation will further complement the business outlook. Ongoing industrial development in conjunction with the adoption of smart transformer products to ensure effective demand side management will propel the market across Europe. Restricted energy efficiency measures have impelled manufacturers to shift their inclination towards the production of effective and cost competitive transformer technologies. Prominent players across the market comprise of ABB, General Electric, Siemens, Schneider Electric, CG Power and Industrial Solutions Limited, Eaton Corporation, Toshiba Corporation, Bharat Heavy Electricals Limited, Mitsubishi Electric Corporation, Raychem RPG Private Limited, Amran, Inc., Instrument Transformer Equipment Corporation, Celme s.r.l., Mehru and TRENCH Group. Instrument transformers are electricity-based devices used to isolate or transform voltage and current levels. Major applicability of instrument transformers is to operate instruments along with safely & securely carrying out metering from high voltage or current circuits.